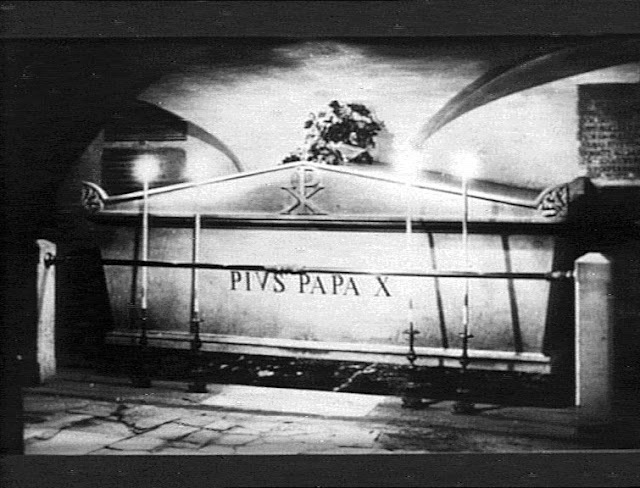 Pope Pius X died on 20th August 1914, shortly after the beginning of the First World War. Despite the timing, The Times devoted two lengthy articles to the life and death of the Pope. On 20th August 1914, the later editions published the news of the death of the Pope early in the morning. On 21st August 1914, it published a thoughtful editorial praising the late Pope. "All men who hold sincere religion and personal holiness in honour will join with the Roman Catholic Church .in- her mourning for the Pontiff she has lost. 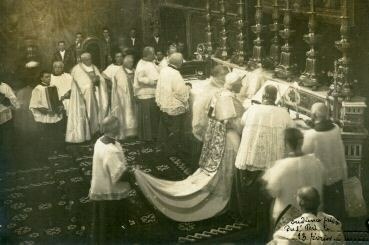 The policy of Pius X has had many critics, not all of them outside the Chureh he ruled, but none has ever questioned the transparent honesty of his convictions or refused admiration for his priestly virtues. Sprung from the people, he loved and understood them as only a good parish priest can do. That was the secret of the love which -he won amongst them from the first and which at Venice made him a great popular power. Not that he ever courted popularity; he taught them as one having authority and could insist upon obedience. But the Roman Church mourns in him something more than a saintly priest and a great bishop; in him she also deplores a great Pope." The above extracts come from The Times Archive which allows you to explore 200 years of history as it appeared in the original pages of The Times newspaper from 1785-1985. Registration is free and unlimited. One can save print and e-mail favourite articles. What are they commemorating ?